One of the best ways to smell a fragrance, we believe, is just to let go. By this we mean to let go of the will - a very philosophical concept which makes you think of Schopenhauer and Buddhism more than about cultivating your nose, a priori. It all goes back however to the phenomenon of smelling: it's about a state of mind more than about flaring up your nostrils with all the technical mastery you can muster. So that when you're not looking for a scent, it can reach you sometimes much more surprisingly and, we could say, objectively. It is blind-smelling without the pre-defined purpose. You're smelling at your most free and by inadvertence; you're encountering perfumes - or rediscovering them. These are the real show-stoppers of your environment, totally unadvertized and smelling great just by themselves. Habitat is this home decor chain store where you might enter for a bit of browsing on the latest home trends, not necessarily to buy perfume. 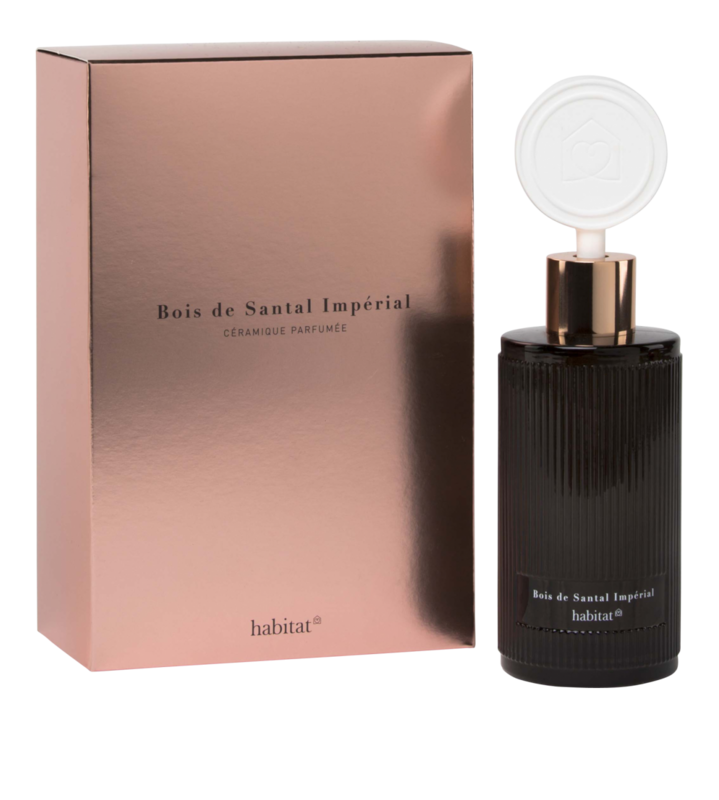 The lovely sillage that filled the area where the home fragrances were on display was coming from a reed diffuser containing Bois de Santal Impérial. Notes are said to be ylang-ylang, amber and sandalwood. It's available in different kinds of diffusers and in candles. It just smells warm, relaxing and subtle. Those who love linden blossom can raise their hands. We love it and a basket filled of these just smelled like the real thing. Melvita more generally are known for putting the accent on natural ingredients. This is a very fresh, vaguely honeyed floral scent both intense and soft. You can't miss out on these if you're always looking for the perfect linden blossom scent. We weren't looking but it just jumped at us in all of its olfactory glory. The "cream" part in the soap's name refers to shea butter. We knew the Almond Shower Oil well. We dabbed on some drops of this body oil just to check whether it was nourrishing for the skin - and then we went our merry way to do other things. But then, we had to pause and think harder because there was this absolutely lovely floral scent wafting around us from somewhere. It turned out to be the Almond Supple Skin Oil. In our opinion, you can use it as just a scented oil on the pulse points for those who like clean yet ravishingly feminine fragrances. A hippie-era store was letting this perfume snake out onto the street. It smelled ravishing. We had to trace back and then had to ask the store manager what the perfume was. She pulled out two boxes of incense. After asking what the current perfume was playing, like you can ask the store staff sometimes what music they're playing, she certified me it was this box - and it was. Incense is not the healthiest of products - some say it can cause cancer - so we burnt it twice, throat itching, and stopped, hoping one day to find its exact perfume equivalent - even thinking of infusing it in oil. It's worth experiencing. It's stored in our memory. When I first purposefully smelled the reformulated Opium eau de parfum a few years back, I thought it was "blockier" than the original and it left me indifferent. Smelling it inadvertently however made me think of - and I quote my initial tweet "Smelt sth lovely on the bus: Coca-cola, irises, Sprite, musk, amber -" Opium edp has become more gourmand because this is what is expected nowadays in perfumery. People want to taste their perfumes too and have visions of subliminal, floating desserts in the air. It's delicious, warm and in a way, it's true, simpler. Opium edp now bespeaks of a new form of addiction and we're not in an opium den anymore, but in a pastry shop selling spicy, ambery sweets.